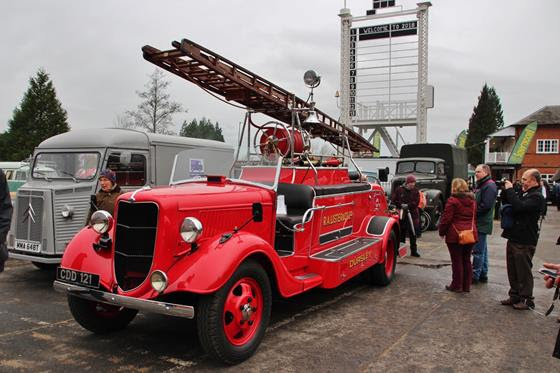 Brooklands Museum celebrated the end of a record-breaking 2017 with an amazing turnout of 1,119 classics, sports and supercars and over 5,600 people at its 2018 New Year’s Day Classic Gathering. The relocation and restoration of the WWII Bellman Hangar that had stood on part of the original Finishing Straight of the Brooklands Race Track for over 75 years gave classic owners an even larger space on which to display their cars. Early and rare pre-War cars congregated in the Paddock in front of the Clubhouse and, amidst the Bentleys and Austins was an MG L2 Magna Sports from 1933 owned by David Naylor. One of the rarest cars present was a 1937 Autovia Sportsman saloon – one of only 36 of these Vee-8-powered cars built by an offshoot of the Riley company. Amongst a huge turnout of Americans on display on the Finishing Straight was an extremely pink Cadillac Eldorado convertible and a spectacular 1949 custom Mercury coupe, while British presence ranged from a Rolls-Royce Phantom VI limousine to Commercials which included a pair of Fordsons,: a Perkins-powered 7V truck and a 1937 E27N fire engine. On the Banking itself, yet more examples of British Leyland gems could be found amongst Jaguars, VWs, Austins and Citroëns spreading in both directions two and three deep. Elsewhere, the site was awash with icons like a silver Vauxhall Firenza, a bright blue 1959 Isetta from just a few miles away from Cobham, and at least four examples of the Ford Anglia 150E. A racing green, convertible Jaguar XK120 attracted many admirers as did a very original black 1954 Wolseley 6/80. The Museum’s exhibition areas including the Motoring Sheds and recently opened Aircraft Factory and Flight Shed were open all day displaying vast collections of classic racing cars, aircraft and motorcycles.